Officially known by its very long name of the Hong Kong Special Administrative Region of the People's Republic of China, Hong Kong is a unique Asian location that is home to over 7.4 million people of all different nationalities. It's one of the most culturally diverse and exciting locations on Earth, filled with all sorts of different ideas, businesses, attractions, landmarks, and things to do and see. There are more skyscrapers in Hong Kong than anywhere else on Earth, with the vast majority of these high-rise buildings being located in the popular Victoria Harbour area, and the region is also known for its extremely high quality of life, ranking very highly in terms of healthcare, life expectancy, education, income, and general happiness of its citizens. It's a popular stopping point on many trips around Asia, being particularly popular for its stunning night life, restaurants, bars, and shopping areas, as well as being home to some amazing family attractions that can appeal to people of all ages like Ocean Park and Hong Kong Disneyland. So, whether you're heading up to Victoria Peak to admire the region from above, strolling along the water's edge at Victoria Harbour and admiring the skyscrapers, searching for your next buy in the shops of Tsim Sha Tsui, or enjoying the rides and shows of Ocean Park and Disneyland, you'll find a lot to love in Hong Kong and one of the best ways to make the most of your trip is to stay in a hostel. 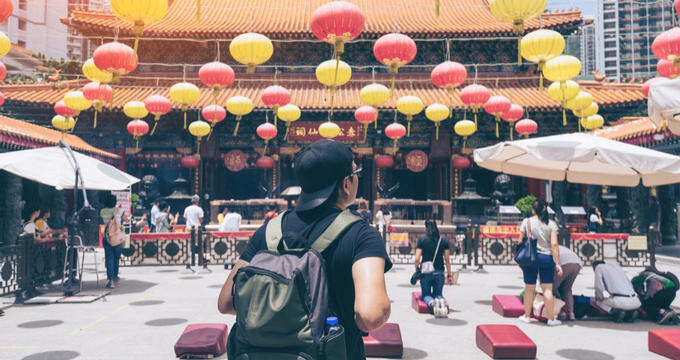 There are many highly rated hostels to be found all around Hong Kong, with these locations providing affordable accommodation to travelers from all around the world. Keep reading to learn all about a few of the best hostels in Hong Kong. Nicely situated in the Causeway Bay area of Hong Kong, the YesInn is one of the top rated hostels in this region and once you step through the doors, you'll start to understand why. Past guests have spoken highly of the cleanliness and comfort of the dorms at this hostel, and the whole place is really nicely decorated too with a lot of bright colors and simple yet effective furnishings that help to create a warm, welcoming environment in which every guest can feel truly at home. This hostel is only minutes away from some of the top spots in the region like Victoria Harbour, so you can head out and visit lots of different shops and restaurants, as well as walking along the waterfront and admiring the city's skyline, while still only being 5-10 minutes away from your hostel. You'll also be able to benefit from a rooftop garden, free iPad usage, a BBQ grill, and a communal kitchen at this excellent Hong Kong hostel. Situated up in the Tsim Sha Tsui neighborhood of Hong Kong, the Urban Pack Hostel is perfect for urban travelers and shopping addicts due to its key location in one of the best and busiest parts of the region. You'll find lots of amazing shops to check out in the local, with plenty of amazing bars and restaurants too. Be sure to take a walk along Knutsford Terrace to admire the views of the Hong Kong skyline on Victoria Harbour in the evenings before heading back to the hostel. The Urban Pack Hostel offers rooms and dorms that are nicely fitted out with standard bunk beds and comfortable bed linen. The rooms and dorms are pretty basic, but comfortable, with a good degree of privacy given to each guest and little bonus features like hanging rails for your clothes and power outlets by the side of the bed. You'll also be able to enjoy free wireless internet, regular live music nights, a lounge area, and a shared kitchen space at this Hong Kong hostel. If you're looking for a clean, safe, affordable hostel in a good spot for traveling around Hong Kong, the YHA Mei Ho House Youth Hostel is the place to be. This hostel is situated up towards the northern side of Hong Kong, so it's a bit of a distance away from the main shopping areas and the stunning skyscrapers of Victoria Harbour, but it does benefit from being in a very quiet and relaxing area. Plus, with good public transport links in the local area, you can be in the heart of Hong Kong in a matter of minutes, so the location of this hostel is more or less ideal. There are both private rooms and dorms at this hostel. The dorms feature simple bunk beds, some basic storage, and a few extra little furnishings like chairs and desks. The hostel also features its own cafe and terrace area, along with a large communal kitchen for all guests to easily prepare their meals throughout the day. Not only that, but you'll also get free Wi-Fi and breakfast included in the cost of your stay, so this is a great value option too.